Kalamunda Senior High School’s uniform policy was developed by the School Board in accordance with Department of Education policy and guidelines on dress standards for students in public schools. 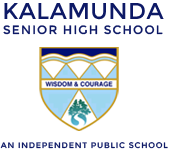 The wearing of school uniform is supported by the Kalamunda community and is a symbol of pride in the school. There is an expectation and a condition of enrolment that students will comply with the school uniform. At the end of the 2014 school year, the Uniform Shop which was located on the school site closed. It had been run for many years by an amazing group of parent volunteers. School uniforms can now be purchased through LOWES at Belmont Forum Shopping Centre. Uniforms can also be purchased online (www.lowes.com.au) or in the store. LOWES will pay a commission to the school on every item of school uniform sold in their local store.